Dr. Krebs is a native of Germany and moved to the United States in 1997. He spent seven years in Colorado where he completed his veterinary degree at Colorado State University in 2004. After an Internship at the University of Illinois, Dr. Krebs practiced as a general practitioner in rural Arkansas for two years before returning to the Midwest to complete his small animal surgery residency at Iowa State University. 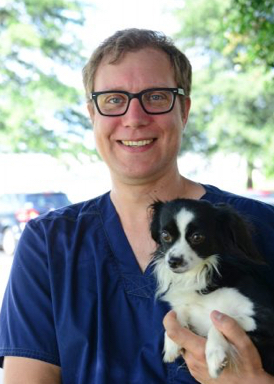 Following his residency he stayed at Iowa State as a soft tissue faculty surgeon and also worked at Iowa Veterinary Specialties to perform soft tissue, orthopedic, and neurologic surgery. He has a special interest in oncologic surgery as well as minimally invasive surgery, including laparoscopy, thoracoscopy, and arthroscopy.